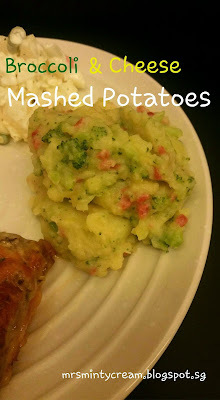 Mashed potatoes, a very common side dish regardless of the main course you are serving for dinner. It goes pretty well with your steak or pork/chicken chops and is not exactly that difficult to prepare. You can even get them ready way ahead of time and just heat them up in the oven before serving. In this recipe, I have added broccoli & cheese to enhance the taste of the mashed potatoes. In that way, I don't have to worry about my mashed potatoes being tasteless. It is so flavourful and healthy at the same time! Yummy! 1. 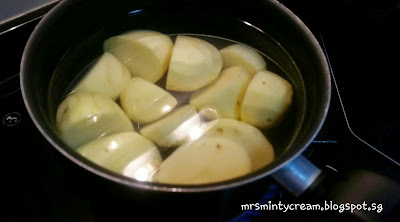 In a large pot, add the potatoes, making sure that they are covered with water. Bring to a boil over high heat. 2. Once the water starts to boil, reduce heat to medium-low and cook the potatoes for another 10 minutes. 3. While waiting for the potatoes, trim and chop broccoli into small dices. 4. 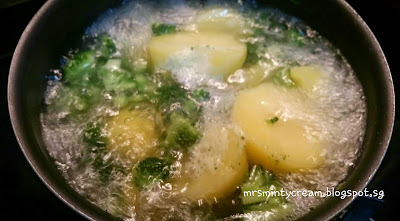 Add broccoli to potatoes and cook them until both are tender (about 5 more minutes). 5. Drain off water from the pot. 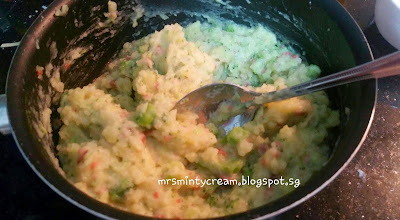 Using a potato masher, make sure potatoes and broccoli are well mashed. 6. Stir in milk, butter, cheese and bacon bits and continue mashing until cheese is melted. 7. Season with salt & pepper before serving.